58 Beach Villas - 65 sqm The Beach Villas are scattered around the Island and have direct access to the beach and have ocean, views. They have either Twin or Queen-size beds with a large attached bathroom with open air shower. Air Conditioning, IDD Telephone, Attached Bathroom, Queen size 0r Twin Beds, Satellite TV, Hot & Cold Water, Mosquito Net, Bath Robe, Hair Dryer, Baby Cots ( On request), Mini Bar, Outdoor Shower, Ceiling Fan, Room Safe, Soap, Torch, Audio CD Player, Body Lotion, Sitting Area, Tea & Coffee, Shampoo, Dressing Table, Veranda, Beach Towels, Maldivian Swing, Sun bed, Umbrella, Resort Information, Huge Cupboard + Hangers. 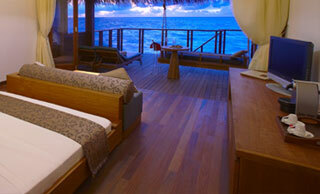 8 Beach Villa Suites - 178 sqm Beach Villa Suites are available for families or small groups. They are two beach villa bedroom units, one with Queen-size bed and one with 2 twin beds, with a central open sitting area along with a Maldivian Swing. Each bedroom has its own bathroom complete with bathtub and open air shower. Air Conditioning, IDD Telephone, Attached Bathroom, Queen size 0r Twin Beds, Satellite TV, Hot & Cold Water, Mosquito Net, Bath Robe, Hair Dryer, Baby Cots ( On request), Mini Bar, Outdoor Shower, Ceiling Fan, Room Safe, Soap, Torch, Audio CD Player, Body Lotion, Sitting Area, Tea & Coffee, Shampoo, Dressing Table, Veranda, Beach Towels, Maldivian Swing, Sun bed, Umbrella, Resort Information, Huge Cupboard + Hangers. 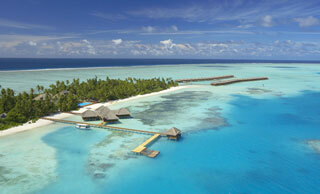 44 Water Villas - 60 sqm The Water Villas are at the southern end of the island and are built on stilts over the lagoon. Each villa has either twin or Queen-size bed, a large patio with steps leading down to the ocean. Bathrooms are enclosed with a separate bathtub and shower stall. Air Conditioning, IDD Telephone, Attached Bathroom, Queen size 0r Twin Beds, Satellite TV, Hot & Cold Water, Mosquito Net, Bath Robe, Hair Dryer, Mini Bar, Outdoor Shower, Ceiling Fan, Room Safe, Soap, Torch, Audio CD Player, Body Lotion, Sitting Area, Tea & Coffee, Shampoo, Dressing Table, Veranda, Beach Towels, Maldivian Swing, Sun bed, Umbrella, Resort Information, Huge Cupboard + Hangers. 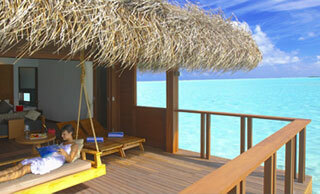 2 Honeymoon Water Villas - 152 sqm Honeymoon Water Villas are located in the middle of the lagoon. They have a large sitting area and sunbathing deck. 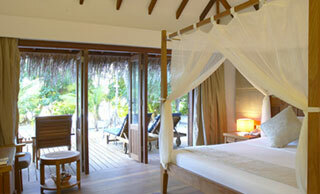 The bathroom is complete with open air shower and a Jacuzzi offering spectacular views of the lagoon. Access is by private dhoni from the main island. Air Conditioning, IDD Telephone, Attached Bathroom, Queen size 0r Twin Beds, Satellite TV, Hot & Cold Water, Mosquito Net, Bath Robe, Hair Dryer, Mini Bar, Outdoor Shower, Ceiling Fan, Room Safe, Soap, Torch, Audio CD Player, Body Lotion, Sitting Area, Tea & Coffee, Shampoo, Dressing Table, Veranda, Beach Towels, Maldivian Swing, Sun bed, Umbrella, Resort Information, Huge Cupboard + Hangers. 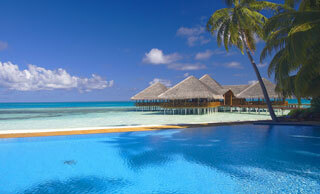 MALAAFAIY RESTAURANT; The Malaafaiy Restaurant is situated beside the pool, overlooking the lagoon. It offers buffet style breakfast, lunch & Dinner with culinary influences from around the world. Sumptuous buffets await you for breakfast, lunch and dinner. Taste different worlds at our "theme nights"
VILU BAR: The Vilu Bar is built over the lagoon, offering spectacular Beach & Ocean Views. It offers a wide selection of premium beverages and cocktail as well as extensive snacks and munchies menu. Quench your thirst in the bar on the lagoon, where you will be spoilt for choice and in the centre of social activity. AL FRESCO: The Al Fresco lagoon restaurant at the pavilion serves a wide range of beverages and A la Carte specialties in an open air setting allowing you to see the sunset. Fresh water Swimming Pool, Table Tennis, Library, Volleyball Court, Board Games, Billiard, Half Dar & Full day Excursions, Fully Equipped Gym open 24 hrs, Spa at Medhufushi for relaxation, Towels at pool side, Laundry service Internet Facilities, Medical Facilities, Swimming, Medhufushi Spa/ Over Water, Water Sports Center, Catamaran, Windsurfing, Canoe Riding, Water Skiing, Banana Boat, Fun Tubes, Snorkeling, Werner Lau Diving School.